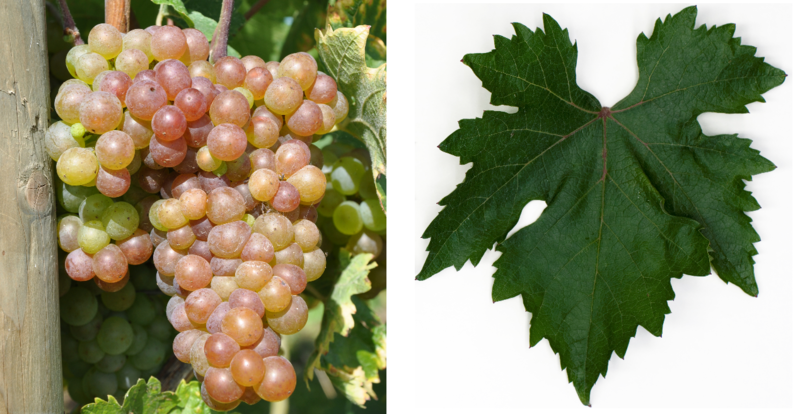 The white grape probably comes from Austria or the former monarchy Austria-Hungary. There are over 150 Synonyms that testify to the old age and the (in the beginning) wide spread in Central and Eastern Europe. The most important alphabetically grouped by country are Velteliner Rouge, Velteliner Rose ( France ); Veltliner Rosso ( Italy ); Ariavina, Feldleiner, Feldleiner Rothlichter, Feldliner, Feldlinger, Fleischroter Veltliner, Fleischrother Velteliner, Fleischrother Veltliner, Fleischtraminer, Fleischfleischraube, Fleischweiner, Großer Roter Veltliner, Männlichen Ariavina, Ranfolina, Roter Riesling, Roter Velteliner, Rotmuskateller, Roter Muskateller, Rotreifler, Todarrer Rotreifler , Ziegelroth ( Austria ); Buzyn, Roter Veltliner Baldig, Veltlínske Červené Slovakia ); Ryvola Cervena ( Czech Republic ); Maucnjk, Mavcnik, Mavenick, Mavenik, Nagy Veltelini, Piros Veltelini, Shopotna ( Hungary ). Zierfandler : Crossing with Traminer? To the sort Green Valtellina so far no familial connection could be proven. Roter Veltliner could possibly be a grandparent of it. The variety was also crossing partner of the new breeds devín and Hetera, The late-ripening, high-yielding vine is prone to Botrytis and sensitive to frost, A peculiarity of the not unproblematic variety are the often occurring, different berry ripening on a grape. However, it yields spicy, extract-rich, acid-laden white wines with aromas when fully ripe pepper and prolonged almonds, as well as reduced yield and good storage potential. The variety is in Austria mainly in the wine-growing areas Wagram and Weinviertel common. In 2009, it occupied a total of 193 hectares with decreasing tendency (in 2000 there were 258 hectares). As a specialty she is already for decades from the winery Mantlerhof in Gedersdorf-Brunn Krems (Lower Austria) cultivated by selection and especially maintained. Other stocks exist in Italy (South Tyrol), Slovakia (360 ha), Switzerland, the Czech Republic and Hungary (23 ha). In 2011 the variety was accepted as a "passenger" of the "Ark of Taste". It is one of the Foundation's Slow Food excellent foodstuffs that are to be protected and preserved against the risks posed by industrial agriculture and the food industry. This page was last modified at 17 November 2018 at 09:47.